Think you’ve seen everything Bloomsburg has to offer? Well, here’s something not so new that has managed to stay quiet for the most part, but it is ready to break out of its shell. The name says so much, but still doesn’t give it the credit it deserves. Incredible Popcorn is located on Old Berwick Road in Bloomsburg! The options here are endless, and it doesn’t stop at popcorn. 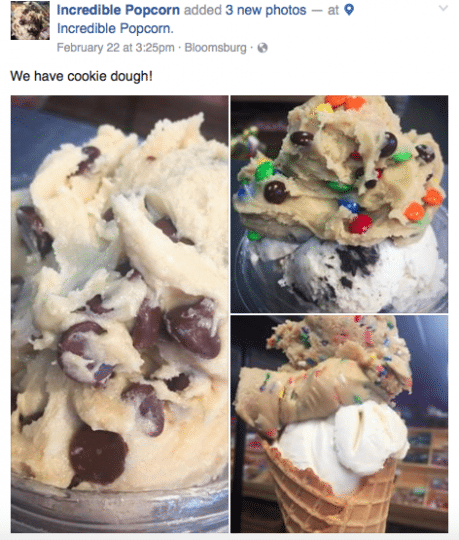 The small business sells a large selection of candy, chocolates (including chocolate covered bacon), homemade ice cream, and within the past three weeks they’ve added cookie dough! Something that completely sets this small business apart from any others is their incredible service and accommodating staff. On a Facebook post introducing cookie dough, a customer asked about a specific popcorn flavor. The administrator for the Incredible Popcorn account responded that it was seasonal, but they can make it for them.